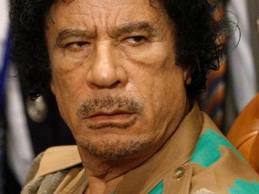 Gaddafi’s political end is near – it even may be a fact by the time I finish this post. But predicting political developments is risky, it is much safer to look back. I can’t help it: I look at the past every time a dictator is removed, I think of all his friends who suddenly turn their back to their former ally, business partner or generous sponsor of development projects or – even- subversive activities. Hence also now, when the Gaddafi regime is crumbling. Gaddafi is no stranger to Liberia. When Moammar Gaddaffi seized power, in 1969, he became one of the world’s youngest heads of state. At that time William V.S. Tubman ruled in Liberia. William R. Tolbert who became President after Tubman’s death in 1971 changed his predecessor’s rigid, western-oriented foreign policy. In 1974 President Tolbert and Moammar Gaddafi, head of Libya’s Revolutionary Command Council, signed an agreement for economic and commercial cooperation though it would take nearly five years to formalize the entire agreement, in 1979 – under the administration of then Finance Minister Ellen Johnson Sirleaf. 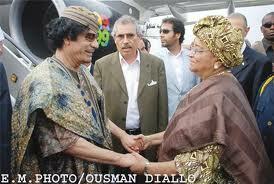 Gaddafi visited Liberia the same year, on the occasion of the OAU summit which was held in Liberia. The following year the coup d’état took place that changed Liberia’s history. Gaddafi immediately expressed support for the new military junta, led by master-sergeant Samuel Doe, but, after initially hesitating between a pro-US or a pro-Soviet stance, Doe opted for the Americans. US President Reagan, inaugurated in 1981, was very pleased with ‘Chairman Moe’ who closed the Libyan embassy in Monrovia, a decision which revealed a rift in the ruling People’s Redemption Council (PRC), its Vice-Chairman Thomas Weh-Syen criticizing Doe’s decision. Thomas Weh-Syen represented the left-wing of the PRC, opposing relations with the USA. When in 1981 Weh-Syen returned from a visit to Gaddafi’s Libya he was arrested, accused of plotting against Doe, and with four others executed on August 14, 1981. Despite Doe’s dislike for the Libyan leader he visited Tripoli, the capital of Libya, in 1988, when US-Liberian relations were increasingly growing sour. It has been reported that Libya invested over USD 100 million of investments in Liberia between 1980 and 1990. Investments included the creation and commercialization of the Union Glass Factory, which exported glass bottles to Mano River Union (MRU) partners Ivory Coast, Sierra Leone and Guinea, and the construction of the Pan African Plaza, which now houses the staff of the United Nations Mission in Liberia (UNMIL). During the present administration of President Ellen Johnson Sirleaf economic and diplomatic relations between Libya and Liberia were increasing – until June this year. Bilateral cooperation increased with Libyan-funded agricultural projects and with Libyan investments in Liberia’s infrastructure. Gaddafi’s fall will mean these projects’ end, or at least a temporary standstill. In January 2009, Colonel Moammar Gaddafi made a stopover at the Robertsfield International Airport in Harbel, Liberia, where he met with President Sirleaf. Two years later Ellen Johnson Sirleaf visited Tripoli. Apparently, relations between the two Heads of State were more than good, given the images of their meetings and the length of the January 2011 visit. What was intended to be a one-day visit lasted three days, January 6-8. On the first day of her visit, President Sirleaf was offered a dinner by the Libyan leader. Talks were held on a great variety of topics: on the Community of Sahel-Saharan States (CEN-SAD) and other African issues like the crisis in the Ivory Coast and the related problem of the over 30,000 refugees. President Sirleaf and the Libyan leader also had a comprehensive review of the Libya funded projects in Liberia, notably the Foya Rice project, the Ducor Hotel rehabilitation project, the rehabilitation of the rubber processing plant in Bong County, and the Libya-donated tractors. The USD 30 mln Foya Rice project, in Lofa County, is one of the most controversial agricultural investments in Liberia and is being implemented through the Foundation for African Development Aid (ADA), a Libyan company, and Libya Africa Investment Portfolio (LAP). Reportedly the project failed before it even started and not a grain of rice has been harvested. Furthermore, the Liberian government had formally handed over to the Libyan African Investment Company (LAICO) the Ducor Hotel in Monrovia and the Gbarnga Rubber Processing Site, both of which were to be redeveloped with Libyan financing. The cost of the two projects were estimated at USD 65 million. Before leaving Tripoli President Ellen Johnson Sirleaf extended an invitation to Colonel Gaddafi to join her at this year’s July 26 celebrations in Lofa County as her special guest. However, a month after the meeting in Tripoli, the revolt started in the Great Socialist People’s Libyan Arab Jamahiriya, echoing events in neighboring Egypt and Tunisia where dictators had been forced to relinquish power. Four months later, on June 16 Liberia severed diplomatic relations with Libya, joining an increasing group of countries distancing themselves from a former ally, friend and partner. That was three days after US Secretary of State Hillary Clinton had urged African leaders to drop Gaddafi at the AU headquarters in Addis Ababa, Ethiopia’s capital. This entry was posted in Arab Revolution, Charles Taylor, Ellen Johnson Sirleaf, Gaddafi, Liberia, Mano River Union (MRU), Samuel Kanyon Doe, Thomas Weh-Syen, William R. Tolbert Jr., William V.S. Tubman. Bookmark the permalink.